Their love for Chicago sports teams brought together Orland Park native Kim Janozik and Lake Zurich native Matt Brumley. In March 2013, a mutual friend introduced the two at a bar just outside Wrigley Field, home of the Chicago Cubs. Their first official date was watching the Chicago Blackhawks as they defeated the Boston Bruins to win the Stanley Cup in 2013. As time went on, it was clear to family and friends that they were meant to be together forever. “Pretty early on in the relationship, we could both sense that was the route we were heading in,” Kim says. Matt knew he wanted to propose to Kim, but he had two obstacles: he didn’t know how he’d do it, and he wanted it to be a surprise. When the couple went ice skating in Chicago in February 2015, Matt saw his chance. He had the wedding ring in his possession for just two hours before making his move. After the couple smiled and looked at the camera, Matt turned and dropped to one knee. The hunt was on for a place where the couple could celebrate their wedding. When the couple stepped inside Fishermen’s Inn, in Elburn, they knew they had found the right place. Couples who book the barn-style Fishermen’s Inn are given exclusive use of the facility and grounds, including its several social event rooms. The Loft and Great Room feature 30-foot barn wood beams, stone columns and reclaimed barn wood. Fishermen’s Inn features breathtaking views of the 20-acre landscape, seven spring-fed ponds and beautiful gardens. 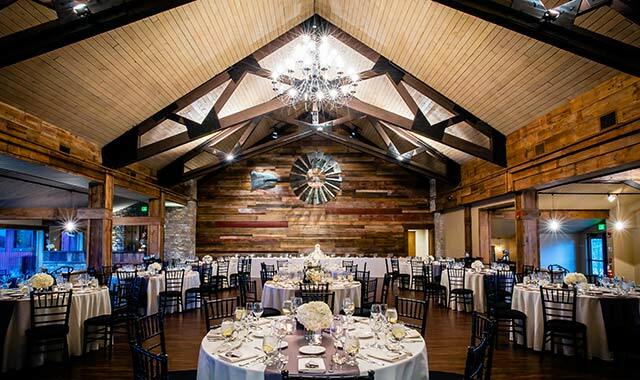 The uniquely rustic, elegant venue offers outdoor wedding sites and an indoor space that holds up to 300 people. Patti Southern, co-owner of Fishermen’s Inn, says many couples now book their weddings at least a year in advance, so the callendar fills up quickly. The venue hosts about 85 weddings each year, year-round. “We still have availability for 2017, but we are also scheduling weddings into 2018,” Southern says. Kim and Matt booked the venue about 15 months before their June 10, 2016, wedding. “We immediately fell in love with the venue, and we didn’t want to risk it becoming unavailable,” Kim says. Photographer: David and Stephanie Weddings, Lee, Ill. It was a high school romance of a different sort that blossomed when Robert and Francesca Murphy met in 2014 at John Hersey High School in Arlington Heights. Like two teens in love, the pair instantly fell head over heels. There was only one difference: Robert and Francesca weren’t students. They were teachers for Township High School District 214 when they met at work through a mutual friend. The couple knew they were meant for each other after their first date in June 2014. “It was pretty much a done deal,” says Robert. Robert and Francesca were married on July 16, 2016, at Our Lady of the Wayside Catholic Church in Arlington Heights. The pair had grown up just minutes from each other in Cook County. Francesca, whose parents were born in Italy, had one request when selecting a wedding venue. “For an Italian family, food is really important,” says Robert. The couple found what they sought in The Stonegate Conference & Banquet Center in Hoffman Estates, which could accommodate the couple’s 330 guests and their culinary expectations. The Stonegate served dishes that were made entirely from scratch, including crab and seafood appetizers. The Stonegate hosts nearly 150 weddings each year and offers flexible reception options, allowing couples to customize their wedding experience. Francesca and Robert started the night with a cocktail hour in The Stonegate’s foyer and lakeside pavilion. There, guests enjoyed hors d’oeuvres and live music by Big Al Wetzel Band. “Everybody there who wasn’t married said they wanted to use that band for their wedding,” Robert says. After cocktail hour, the party moved to the Ballroom, a large, elegant banquet hall attached to the pavilion tent. Around 11 p.m., the remaining guests moved back to the tent for a late-night after-party with an open bar and snacks. The couple received plenty of remarks about the friendly service and professionalism. They know The Stonegate played a large role in their wedding day’s success. Dustin Gronau’s proposal to Meghan Donnelly didn’t go as planned. In fact, Meghan actually found the ring. Meghan was suspicious, but decided not to open the box. The decision led to a wonderful surprise on the second night of their cruise. After enjoying a formal dinner, Meghan and Dustin went back to their room to relax on the balcony, drink champagne and enjoy their vacation time. That’s when Dustin proposed a toast. The Beloit natives had been dating since high school. Dustin initially was attracted to Meghan’s intelligence, stunning looks and dynamite personality. He knew after senior prom that he wanted to get married. Meghan took a bit longer to arrive at the same realization. Choosing a wedding venue was a piece of cake for the couple. 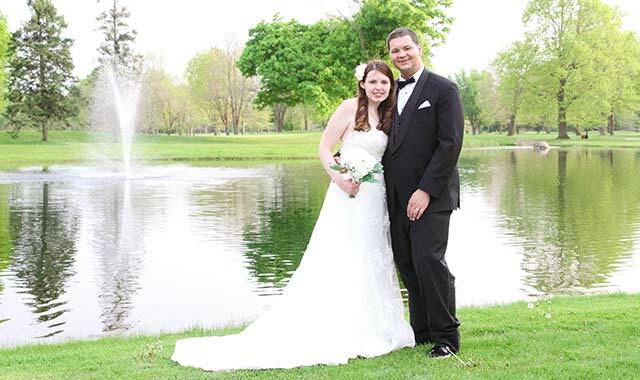 Meghan’s father has been a member of Beloit Club for about 20 years, so the bride knew right away that she wanted to have her reception there. She booked her May 7, 2016, reception a year in advance. The hilltop clubhouse looks out onto an 18-hole golf course where Meghan and Dustin took photos after their wedding. Spanning the top floor of the clubhouse, their reception treated guests to the luxuries of a full bar and expansive balcony facing the back of the property. The couple have received many compliments from their 250 guests about the venue and the food. The grilled cheese sandwiches served at 10:30 p.m. were especially a hit after a few hours of dancing. The Gronaus left for their honeymoon the day after their wedding: a TransAtlantic cruise to London, Paris, Venice and Rome. Reception/Catering: Beloit Club, Beloit, Wis.
Ceremony: First Congregational Church, Beloit, Wis. Photographer: TLC Photography, South Beloit, Ill. Flowers: Beloit Floral, Beloit, Wis.
Bride’s Gown: Veils and Tails, Clinton, Wis.
Limo: Magical Night Limo, Oconomowoc, Wis.
Kelly Clayton had a crush on her older brother’s best friend, Cody Klingberg. She was attracted to his sense of humor and kindness toward others. Cody found himself attracted to Kelly’s work ethic. “She’s dedicated to anything she puts her mind to,” Cody says. After a year of dating, Cody planned an elaborate scavenger hunt on a chilly day in February 2015. From morning until night, Kelly opened envelopes that determined what activity the couple did next. After enjoying a romantic dinner followed by frozen yogurt, the couple went for a walk around the neighborhood with their dog, Harleigh. When they got home, Cody said he had to get something from his truck. 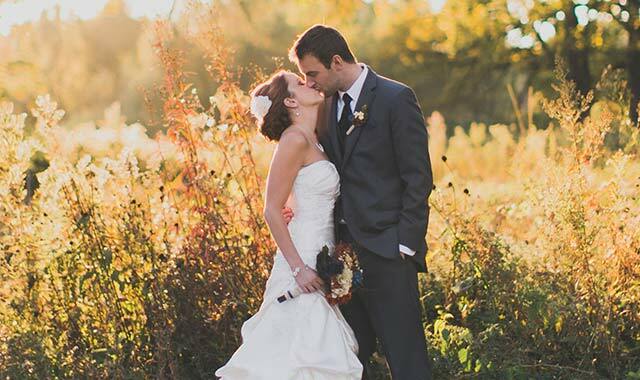 Within weeks, the couple had booked their wedding reception at Acquaviva Winery, in Maple Park. They had been there before for a wine tasting and loved the property, as well as the wine. Neither Kelly nor Cody wanted a typical banquet setting, so they loved the unique vineyard atmosphere and outdoor patios, which gave the wedding a destination-style feel. Kelly loved taking pictures at the winery and around the vineyard. Meeting with Joe and Shelly Brandonisio of Acquaviva Winery helped to make the planning process less stressful for the couple. 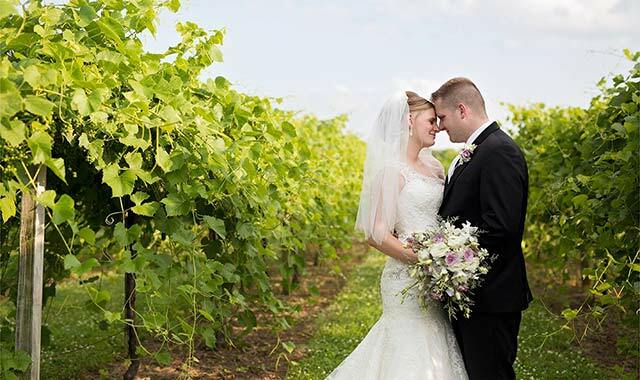 Though Acquaviva Winery hosts up to 100 weddings per year, Joe and Shelly made themselves available to help the couple plan their special day, which happened on June 25, 2016. Shelly takes pride in having attention to detail, whether the wedding is casual, elegant or a combination. Kelly and Cody were pleased to find how much their 230 guests enjoyed Acquaviva. Kelly wishes she could relive the experience. When Mary McGuire saw Mike in a Speedo, it was all over. She knew she would marry him someday. At least, that’s how Mike thinks it happened. During 13 years of dating, the couple developed a tradition of having a nice dinner every year for each other’s birthdays. After Mary’s birthday dinner in 2015, she received an unexpected surprise. The personal, private proposal was everything Mary wanted. After looking at a dozen venues in the Madison area, the couple fell in love with The Edgewater for its floor-to-ceiling windows and its ideal location on Lake Mendota. The recently renovated and expanded Edgewater hotel boasts more than 200 guest rooms, a community plaza and pier, in-house restaurants and close proximity to the University and the state capitol. 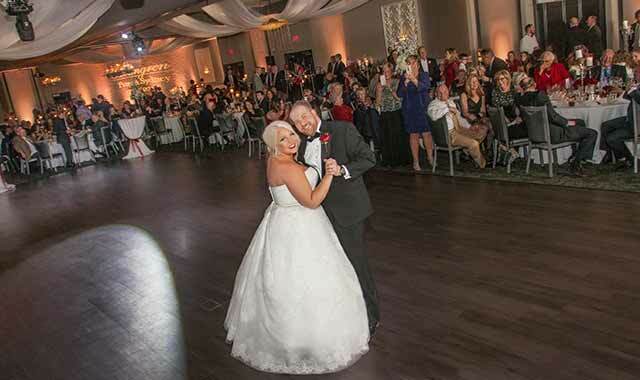 With a guest list that included elderly relatives, new mothers and a few young nieces and nephews, the couple found it convenient to have the ceremony, cocktail hour and reception all in one location, with overnight accommodations in the same complex. 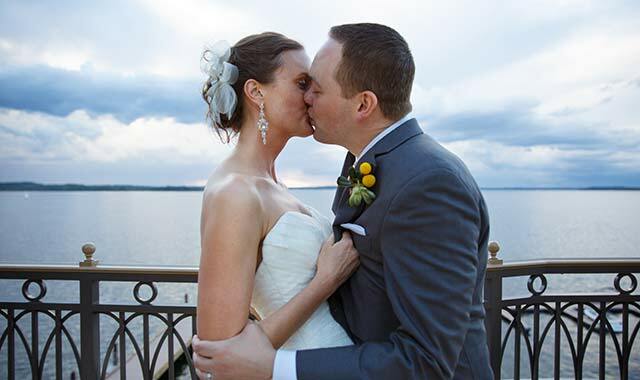 Mike and Mary were initially concerned that getting married at a hotel would be less personal, but found The Edgewater’s views and outdoor patio overlooking the lake were unique from other venues they toured. In addition, it was convenient to have a full spa with a variety of services available, including hair, makeup, nails, facials, massages and more. Mary, Mike and their entire wedding party were able to get ready for their big day right on site. Working with The Edgewater’s wedding concierge, Michael Stapleton, also helped to make the planning process less stressful. He provided vendor suggestions, helped to execute the rehearsal and ceremony, worked with the couple on room blocks and menu choices, and offered assistance whenever possible. While most couples book The Edgewater 12 to 18 months in advance, Mary and Mike were able to book their June 4, 2016, wedding just sixth months prior. They held their reception in the Edgewater’s largest event space, which can comfortably accommodate up to 350 guests with a dance floor and bar. Ceremony/Reception: The Edgewater, Madison, Wis. Catering: The Edgewater and Chocolaterian, Madison, Wis.
Music/DJ/Photo Booth: DJ Magic: Andrew Accola, Madison, Wis. Flowers: KP Designs: Kirstie Pence, Madison, Wis.
Limo: Mad City Party Bus, Madison, Wis.
For Jacki and Ryan Cope, July 4 has always been special. Last year, sparks flew again when the couple revisited Chicago on July 4 and watched the fireworks from Buckingham Fountain with some family and close friends. Under the glowing lights, Ryan proposed. Jacki and Ryan wanted a venue as romantic as their engagement, and they found it when they came across Creek Bend Nature Center in St. Charles. Nestled in the LeRoy Oakes Forest Preserve, the property includes a spacious outdoor setting and a 1930s renovated house, which hosts a variety of events year-round. The couple booked their July wedding nine months out. Ryan grew up in Crestline, Ohio, and met Jacki when he moved to Chicago in 2003 to attend Universal Technical Institute. After graduation, Ryan moved to Florida to work for Mercedes Benz of Sarasota. Jacki graduated from Illinois State University and moved to Florida to be with Ryan. She moved back to Wheaton in 2011; Ryan followed about two years later. The time and location were just right when the two were wed this past Fourth of July weekend. On July 2, Jacki and Ryan said “I do” under a spacious clear-top tent next to the Nature Center, surrounded by 140 guests and the forest scenery. The couple customized the venue to fit their elegant, vintage style. The two were in total control of their wedding day, from catering to tent services. Taking advantage of their freedom, Jacki and Ryan brought in food trucks to cater the reception and add to its fun, relaxed atmosphere. The large circle driveway accommodated food trucks from Porkchop in Chicago, La Cocinita in Evanston and Grill Chasers in Schaumberg. Violet and Pearl Vintage Rentals decorated the elegant house and complemented its furnishings with stylish seating for guests who wanted an escape from the outdoors. “I highly recommend using a rental company to stage the whole interior for you,” Jacki says. The combination of good food, outdoor scenery and backyard atmosphere created an unforgettable experience. Of course, the timing couldn’t have been any more perfect. Wade Russell was nervous for his first date with Megan Bartchlett. It had been a couple of years since they’d seen each other. Megan remembers being a high school freshman the same year Wade was a senior. At the time, she figured Wade was out of her league. After years of doting, Megan decided to be brave. She texted Wade when she was a freshman in college, with no expectations of his replying. When Wade did, she was elated. Wade didn’t wait long before asking Megan on a date. His fears of not having anything in common immediately washed away. They ended their date with a walk around their college campus at Bowling Green State University, in Bowling Green, Ohio. Years later, Wade proposed after walking the same grounds. Megan cherishes the memory of Wade getting down on one knee by the campus clock tower. The couple envisioned having a small, simple destination wedding with close family. While scrolling through Pinterest, Megan discovered her storybook dream in Galena’s Goldmoor Inn. Set in the countryside overlooking the Mississippi River and rolling hills of Galena, Goldmoor Inn’s “castle” feel invoked a feeling of romance, privacy and a special retreat for Megan and Wade. 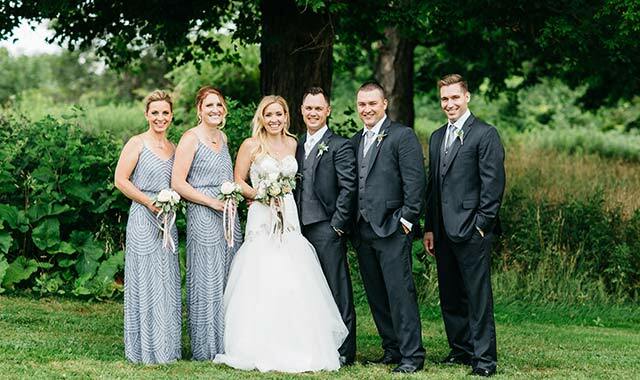 When Megan realized Goldmoor Inn could accommodate weddings from two to 150 people, she knew it was the perfect venue. 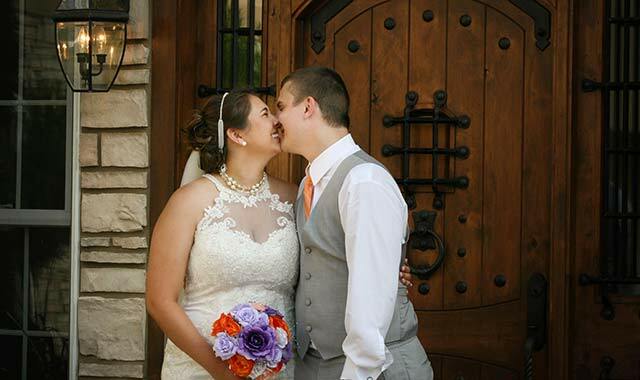 Eight months in advance, she and Wade booked Goldmoor Inn for their wedding on June 25, 2016. The bed-and-breakfast hosts about 60 weddings each year. Goldmoor’s simple, yet elegant setting proved to be a perfect size for the couple’s small party of close family and friends. The wedding coordinator at Goldmoor Inn, Angele DeVere, “magically” arranged everything for the Bowling Green residents, from the flowers, catering and photography to the cake and decor. Not having to stress over the small details allowed the couple to enjoy their wedding even more. “All I had to do was tell them my vision and show up,” Megan says. “Wade and I got there two days in advance and just enjoyed each other, rather than stressing over details. Meagan Wheeler was expecting a proposal from Mike Wizceb, her boyfriend of six years. Whenever she walked into her St. Charles home, she hoped to see flowers, candles – something that resembled a proposal. But she didn’t. “So, I didn’t think he would ever really surprise me,” Meagan says. She got the surprise of her life on Dec. 21, 2012 – the supposed end of the world, according to the Mayan calendar. That night, Mike and Meagan, former classmates at St. Charles North High School, attended an “End of the World Party.” One of Meagan’s friends suggested the couple take pictures, since Meagan is an avid scrapbooker. It was a whole new beginning, on a day the world was supposed to end. The man who originally swept Meagan off her feet while they were classmates at Illinois State University had asked her to be his wife. While she was looking for a place to host her wedding reception, Meagan followed some advice from her mother. Set at the edge of a public park, the Hickory Knolls Discovery Center, in St. Charles, is an environmental education center that doubles as a social events venue. It has space for indoor and outdoor wedding ceremonies and accommodates receptions with 175 to 200 guests. A relatively new venue on the wedding scene, Hickory Knolls is flexible with dates. Tricia Claypool, rental and event coordinator, says the venue only hosts eight to 10 weddings each year. Meagan and Mike were married on Oct. 11, 2014, almost two years after their epic proposal. The couple booked their wedding venue well over a year in advance, which was plenty of time, Meagan says. Hickory Knolls is ideal for a couple who love the outdoors. Live reptiles and other small critters are on display throughout the facility, where wide banks of windows offer a supreme view of prairie surroundings and an oak savanna. “They let us rent out the entire facility, they gave us ample time to set up the day before and it is set with the most beautiful background,” Meagan says. Meagan suggests renting out the entire facility, especially if holding a wedding ceremony on site. Liz Schmidt met Drew at San Francisco International Airport in 2009. They were seniors from Miami University, in Ohio, on their way to Dharamsala, India, for a semester abroad. After returning to the U.S. and graduating from college, the couple maintained a long-distance relationship until 2011 when they together moved to Santiago, Chile, to teach English for a year. When they returned in 2012, they began living together in Chicago. In August 2015, Drew and Liz were strolling on the beach, enjoying the end of summer, when Drew felt an urge to be spontaneous. The couple began searching for a wedding venue in Chicago, but faced difficulty in finding the “perfect space” within their budget. When they started looking outside the city, Starved Rock Lodge quickly became their top choice. The venue inside Starved Rock State Park, near Utica, meshed well with their adventurous personalities. The couple were lucky to book the venue seven months in advance. Starved Rock Lodge has about 135 weddings per year, and reservations are often scheduled two years ahead of time. Although the Lodge offers overnight accommodations for wedding parties, the couple opted to camp throughout their wedding weekend. 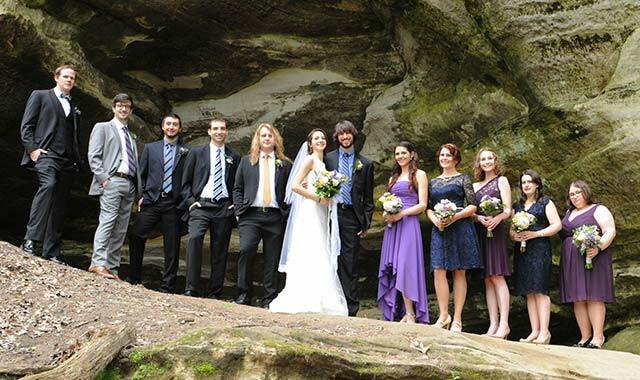 About 100 guests attended the couple’s outdoor ceremony overlooking Starved Rock. Although the May 7, 2016, wedding day had gorgeous weather, venue staff had prepared a back-up location in case of rain. The reception took place in the Great Hall with a cocktail hour in the adjacent Starved Rock Room. Lodge staff offered a host of wedding services for the couple, including a rehearsal dinner and rehearsal breakfast, trolley transportation to take photos at the canyons and seasonal waterfalls, gifts for the bridal party, therapeutic massages for the wedding party, brunch the morning after the wedding, and wedding favors including Starved Rock wine and bubbly, freshly made fudge and popcorn, and souvenir T-shirts. The Lodge has several preferred vendors to help make wedding planning easy. The Lodge additionally helped to accommodate personal touches to Liz and Drew’s wedding, such as a DIY trail mix bar. The most memorable part of the wedding day for Liz was simply feeling others’ generosity and love. Wesley Groom was cute, nice and impressive at line dancing. He instantly caught Courtney Kjell’s eye at Shooters Bar & Grill, in Rockford. Wesley and Courtney became best friends over the next two years. They volunteered together at church, motivated each other at the gym and continued to go out dancing. On Dec. 20, 2015, the couple went with friends and family to the Lincoln Park Zoo in Chicago. Courtney wondered why Wesley appeared to be so nervous. 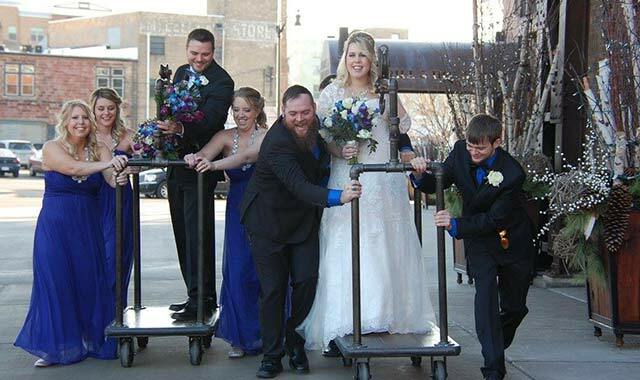 Only six weeks later, on Feb. 20, 2016, Courtney and Wesley walked down the aisle at Central Christian Church in Beloit, Wis.
Courtney knew she wanted to have her reception at Ironworks Hotel the moment she walked in the lobby. 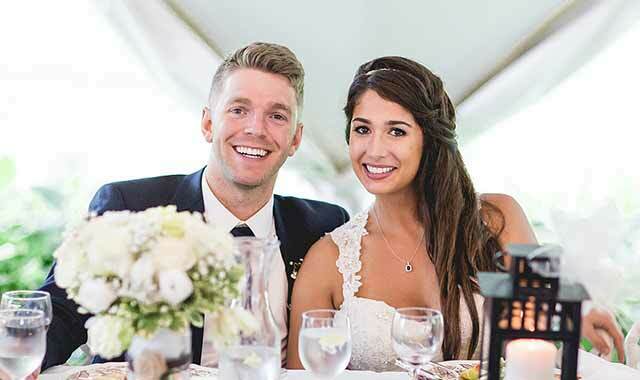 Since it was the wedding off-season, she was able to book the industrial-chic venue on the Rock River just one month in advance of her wedding day. Guests were able to stay overnight in Ironworks’ recently renovated luxury boutique rooms, featuring 18 traditional rooms and 36 suites. Courtney recommends utilizing Ironworks’ event planning team. She loved their suggestions of having a separate head table for the wedding party and using giant wooden chairs for the bride and groom. From appetizers to entrees, the food from the on-site caterer, Merrill and Houston’s Steak Joint, proved a huge success. When the ceremony and wedding pictures went faster than anticipated, Ironworks staff accommodated the couple’s request to serve dinner earlier in order to keep guests from waiting. 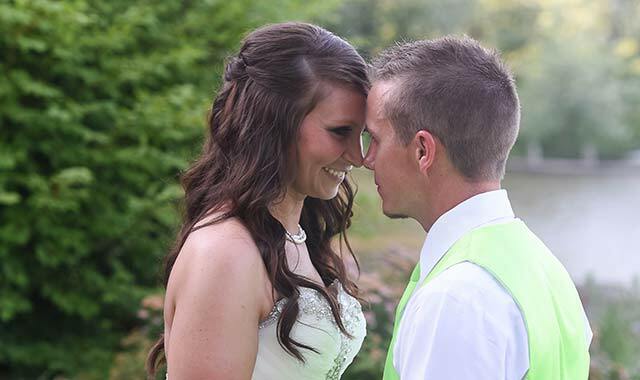 Courtney and Wesley are thankful their wedding went smoothly under last-minute conditions. Ceremony: Central Christian Church, Beloit, Wis. Reception: Ironworks Hotel, Beloit, Wis. Catering: Merrill & Houston’s Steak Joint, Beloit, Wis.
Cupcakes: Amy’s Cakes, Janesville, Wis. Dress Alterations: Bessie’s Creative Sewing, Beloit, Wis.
On a rainy afternoon in downtown Chicago, Kara McKinney and Aaron Villacorta were walking their dog along the shores of Lake Michigan. They’d been dating for three years, having met through a mutual friend. Then Aaron smiled. “Well, I wouldn’t be OK with it, so let’s get engaged right now, today,” he said. Kara laughs when she recalls that magical rainy afternoon. Today, the happily married couple lives in Buffalo Grove, where Aaron works as a logistics broker, Kara as an early childhood specialist. They’re not far from the things that matter most to them – her family in Rockford, his family in Mundelein and downtown Chicago, where they met. In fact, it was at a birthday party for Kara’s mother that the couple first thought about booking their wedding at Franchesco’s Ristorante, in Rockford. The couple’s pastor officiated the ceremony in a decorated banquet room arranged with an aisle for the bridal party to walk down. Lavender, grey and white were the starring colors. “My late Grandpa had always given lilacs to my Mom, so I wanted the lilacs to be part of the decor, in his honor,” she says. After the ceremony, the 275 guests enjoyed a cocktail hour. One of Kara’s favorite touches was a digital montage of family photos that Aaron put together himself, easily accommodated by Franchesco’s AV department. “It’s something we can keep forever,” she says. One of the keys to a great event is employing a high ratio of servers per guest, says Franchesco’s owner Benny Salamone, who hosts 50 to 60 weddings each year. Franchesco’s also supplies linens and centerpieces, if requested by the bride, making her job a bit easier. Samm Hinrichs developed a master plan when she met Ken Dawson, through mutual friends, at a haunted house. After a year of dating, the couple acknowledged they had a serious connection and hoped eventually to get married. Ken bought a ring, but the ‘right moment’ to propose never seemed to arrive. Five months passed as Ken waited for a special, romantic opportunity. Finally, he crafted a master plan of his own. The No. 1 priority when searching for a wedding venue was finding a location with a waterfront view. The couple was thrilled to find Maxson Riverboat and Riverside Restaurant, in Oregon, for their June 25, 2016, wedding. A longtime favorite for casual dining, banquets and dinner cruises on the Rock River, Maxson had the beautiful views the couple hoped for. And, it was close to Polo, where Ken grew up and where the couple now live. “We booked about nine or 10 months in advance, just because we knew it was the place and we wanted to have it,” Ken says. The venue can accommodate 110 people on its paddleboat, 250 on the sprawling pavilion and gazebo, and 280 in the restaurant. Ken especially enjoyed that the whole wedding party could arrive at the reception by boat. The couple also got the pizza and pasta bar they wanted, even though pizza isn’t offered on the menu. Everything was made in house. The Maxson’s staff also ordered specific alcohol that the couple requested, provided containers for leftover cupcakes and kept leftover wedding cake overnight in the fridge. Sydney Cassel’s stubborn nature caused a snag in Peter Holmgren’s original proposal plan. One night in late February 2014, he had organized an elaborate dinner out, but Sydney was steadfast on staying home and ordering in. Only her father knew of Peter’s plan, as he had found out a few weeks prior when Peter sought his blessing. Because Sydney is notoriously hard to surprise, Peter scrambled to keep his secret. He decided instead to propose in their apartment that night. “Needless to say, I was more than willing to go out to a nice dinner after the proposal,” says Sydney. As if to make up for that skipped meal out, the couple’s search for a reception venue brought them right to Giovanni’s Restaurant & Convention Center in Rockford, which is home to a fine dining restaurant and the more casual Alchemy and Big Al’s Bar. 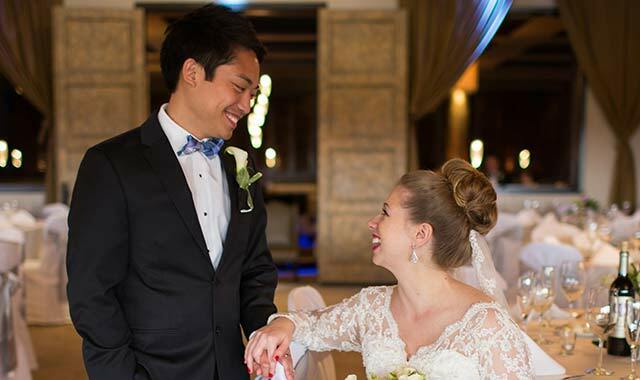 With stunning ballrooms and a dedicated banquet staff, Giovanni’s could more than accommodate the couple’s 443 guests while offering close proximity to area hotels, modern decor, and, of course, handmade meals cooked in-house. The venue typically hosts 75 to 100 weddings each year and can accommodate up to 1,000 guests for receptions, rehearsals and showers. Through Giovanni’s preferred vendors, Sydney and Peter easily chose the finishing details for their big day. For the most part, the couple followed staff suggestions for everything from the florist to the cake. The couple were married on Valentine’s Day 2015, on a day when temperatures with wind chill were in the negative double digits. But inside Giovanni’s grand ballroom, the weather couldn’t stop a perfect reception. But what made their wedding special was the important role of family. Many loved ones traveled to share the day with them, and the couple received many compliments. In fact, it was their mothers, good friends themselves, who first introduced Peter and Sydney when they were children. But because they’re six years apart in age, the Rockford natives didn’t form a romantic connection until they were adults. At the ceremony, Peter’s mother also played a significant role. The judge pronounced them as man and wife. It made the ceremony truly special, says Sydney. Jenn and Steve Fernandes grew up only a mile apart in West Chicago. The high school sweethearts developed an attraction over time. Steve orchestrated an elaborate proposal for Jenn during a concert at the Coast Guard Festival in Grand Haven, Mich. Jenn was “randomly” called to the stage where Steve, in front of nearly 1,000 people, dropped to one knee. After Jenn said yes, her entire family ran from the crowd to celebrate. Jenn quickly got to work in searching for a wedding venue. After touring Oscar Swan Country Inn in Geneva, she knew immediately it was what she wanted. The 8-acre estate with a cozy bed-and-breakfast reminded her of her grandmother’s home. The backyard and garden space accommodated all 150 of the couple’s guests for the June 4, 2016, wedding. Jenn appreciated how flexible the venue was in allowing her to bring in outside vendors. Not having to stick to a pre-planned package was important to her. “We wanted our wedding to be relaxing and fun, and that’s exactly what it was,” Jenn says. This entry was posted on Friday, July 29th, 2016 at 12:00 pm	and is filed under Northwest Woman, Top Posts. You can follow any responses to this entry through the RSS 2.0 feed. Both comments and pings are currently closed.